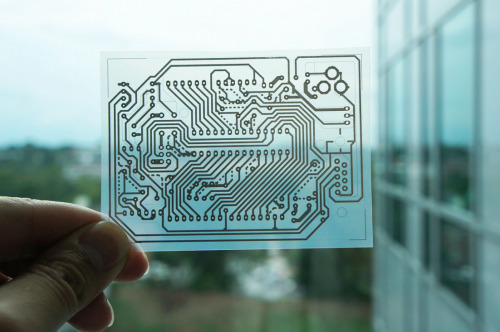 A single-sided wiring pattern for an Arduino micro controller was printed on a transparent sheet of coated PET film. (Phys.org) —Researchers from Georgia Tech, the University of Tokyo and Microsoft Research have developed a novel method to rapidly and cheaply make electrical circuits by printing them with commodity inkjet printers and off-the-shelf materials. For about $300 in equipment costs, anyone can produce working electrical circuits in the 60 seconds it takes to print them. "We believe there is an opportunity to introduce a new approach to the rapid prototyping of fully custom-printed circuits," said Gregory Abowd, Regents' Professor in the School of Interactive Computing at Georgia Tech and an investigator in the study. "Unlike existing methods for printing conductive patterns, conductivity in our technique emerges within a few seconds and without the need for special equipment." "Everything we introduced in our research is available in the market and makes it possible for people to try this at home," said Yoshihiro Kawahara, associate professor at the University of Tokyo and the primary investigator who developed the methodology while in Atlanta. "The method can be used to print circuit boards, sensors and antennas with little cost, and it opens up many new opportunities." "Using this technology in the classroom, it would be possible to introduce students to basic electronics principles very cheaply, and they could use a range of electronic components to augment the experience," said Steve Hodges, a team member from Microsoft Research. To show the capabilities of the new technique for capacitive touch sensing - the interaction prominent in smartphone interfaces - and the flexibility of the printed circuits, the researchers attached a capacitive ribbon with embedded inkjet-printed circuits into a drinking glass. The capacitive ribbon sensor formed to the contour of the glass and, when connected to a micro controller, was able to measure how much liquid was left in the glass. Very expensive and fault-prone compared to soldering. Conductive inks and glues typically have several ohms of resistance in the final circuit, making it difficult to pass analog signals or large currents through. The existing method of home PCB manufacturing uses dextrin coated paper in a laser printer and transfer the pattern to a copper board using a clothes iron to make a proper circuit board by etching. @Eikka: Have you a link to a good working description of that process? Just google for "Toner transfer PCB"
There are various versions, some using glossy newspaper, others using inkjet photo paper, others using dextrin coated paper, and there's even a commercial product called press-n-peel which comes in blue sheets. The point is to print the laser toner onto a substrate that doesn't adhere very strongly with it, so the toner can be transferred onto the copper board with heat and pressure. Then the paper or transfer sheet is simply washed off with water, and the board is etched the normal way with ferric chloride or any suitable etchant. A PCB pen is useful for filling any holes or breakages in the pattern, and for larger boards and finer features, a hot laminating press may be used to give a more consistent results. As a final touch, you can also print a cover layer for the circuit traces that leaves the pads open, to protect the board from corrosion. @Eikka: Thanks, your search string pulled up exactly what I wanted to know.